This compact differential pressure transmitter is particularly suited to filter and pressure monitoring applications in the heating, air-conditioning and ventilation industries. 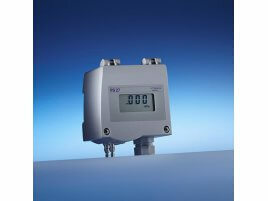 An optional display allows measurement values to be read directly on-site in Pa or kPa. An optional time constant (up to 4s) allows the instrument to generate an attenuated output signal, even under fluctuating pressure conditions. To reduce wiring costs, the instrument is also available in a version with two-wire technology (optional). The PS 27 can be mounted either on a wall or on top-hat rails. The instrument is available with an ISO factory calibration or DAkkS calibration certificate (optional).